Another great material for engraving on a laser cutter is granite. Black granite works very well. Raw black granite is actually light gray in color and is only black after being polished. The laser cutter removes the polished layer which makes the engraving stand out in light gray. I am using a Full Spectrum 45W laser cutter. The plan was to have text, lines as well as a photo engraved. Because there is no color or gray tones the photo has to be dithered. 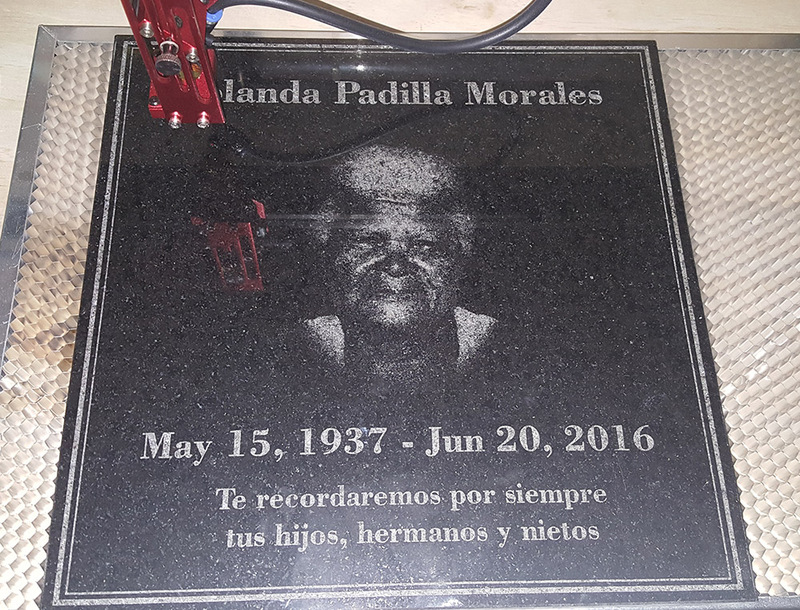 Because engraving in granite or anodized metals requires a negative image I added a black background. It took a few tries to get the best setting. My first try with 100% power and speed ended up with nice lines and text but the photo didnt have any detail. I am sure the issue was with too much power and too much speed. Too much power and the laser will remove bigger chunks and too much speed will cause bleeding as it is too fast for the high resolution. I ended up with 80% power at 50% speed. Lines, Text as well as pictures were rendering very nicely.